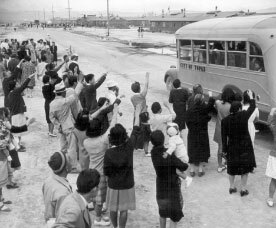 Contrary to what one might think, everyone did not get released from the "internment" camps at the same time, the end of the war. In fact, a very small number went directly from the initial, temporary, "assembly centers" and never reported to the "permanent" camps in the interior of the country. Most often, these were very good students who were able to make arrangements with colleges in the Midwest and East to accept them. Another group of young men were recruited early by the military to work as Japanese language translators in the Military Intelligence Service. Other young men were soon drafted or enlisted to serve in the US Army (see the chapter on Japanese American Military Service). Unfortunately most Japanese Americans were not allowed to return to their Pacific Coast homes until after January 2, 1945. However, some were allowed to leave on either temporary or "indefinite" leave" to the Midwest and East during the war years. Initially, the government had stringent criteria that the incarcerates had to meet before they could leave the camps. Some were placed on "stop lists" which prevented them from leaving. Other "internees" were cleared to attend colleges in the Midwest or East that indicated that they would accept them. A student relocation committee tried to help by finding receptive colleges and obtaining money for students. Many of the able-bodied, who were beyond the college years, temporarily left the camps to do agricultural work. Because of the war, there was a severe shortage of manpower to work on farms. Japanese Americans from the camps were recruited to fill this need. They were paid more than the small amount they made in the camps but they were sometimes exploited. As the war dragged on, the government eased the requirements to leave for the outside world away from the Pacific Coast. One of the reasons they did this was that they could see that the abnormal conditions in the camps was sapping the motivation of the incarcerates. In order to reduce this, some officials wanted them to reestablish normal lives outside of the barbed wire compounds as soon as possible. Also, as the war progressed, the military justification for the incarceration was even further reduced. By 1945, the Supreme Court had ruled that the government could no longer detain loyal citizens. About one-third of the internees had already left the camps by this time. Most of this group were skilled young adults who were likely to find jobs and were eager to "get on" with their lives. However, for many it was frightening to leave for unknown parts of the country. Not only was there the possibility that they could not make a living, but they might also experience hostility from the local people. Those who remained in the camps waiting for the end of the war were old and spoke only Japanese and families with young children. Their goal was to return to their "real" homes on the Pacific Coast. In mid-1945, the government announced that the camps would be closing and the coast reopened. Most families quickly began to pack up their belongings for the trip back. The War Relocation Authority (WRA) gave each person $25 in cash and a train or bus ticket back to their hometowns. Each week, more and more camp families would board the buses that would take them to the train depots. For many, it was the first time they had been outside the barbed wire in three years. They were headed home, without knowing if their stored goods, homes, farms, or businesses were still standing. Hundreds who came back to the Santa Clara Valley discovered the worst — their farmland either auctioned for back payments, or their leased ground rented to someone else. In some cases, their houses had been razed to provide more ground and their stored goods and farm equipment vandalized or stolen. Train depot, city of Santa Clara. National Archives. Amidst all this turmoil, there were some happier stories too. Some farmers and businessmen came back to find their property intact and in some cases, flourishing. Caucasian friends and neighbors had carefully tended the Japanese American properties, often guarding the boarded up homes and sometimes even farming the land and sending the money to camp or using it to pay the land payments or taxes. Many of the returning families, unable to stay with relatives or find decent housing, ended up at hostels in local churches. San Jose's hostel was at the Buddhist Church Betsuin on North 5th Street in Japantown. Others stayed at the Japanese American owned Gilroy Hotsprings, in those days, a rough rural retreat without many amenities. The hostels provided hot food, showers, and sleeping cots for the in the gymnasium. There was little privacy and it was difficult to maintain any type of family life. Some families only had to stay at the hostels for a few days while others had to live there for several months. Each day, men and women left in the morning to find work and housing. Mothers and grandparents stayed behind to watch the children. The WRA ran an employment office with listings of job openings. Agricultural openings were passed on by word of mouth. Often it was the women that found employment first — as domestics and laundry workers. The Japanese who had the hardest time returning were the old Issei immigrant farm laborers. These were the pioneer men who had come to California beginning in the 1890's. Some had never married and had no children. At the time of incarceration, these Issei, after a lifetime of back breaking farm work, were old and in poor health. In camp, they had been housed in the bachelor quarters and they had had adequate health care. When they returned to the Pacific Coast, many had nowhere to go. In San Jose, the small Japantown hospital and cash strapped community could not provide the care these men needed. Finally, they ended up in several wards at the county hospital. San Jose farmer, Eichii Edward Sakauye, who was a young man at the time recalls: "My dad knew a lot of those old guys. Many of them had had strokes, heart conditions, Alzheimer, or were just plain old and broken down. They didn't have a single living relative in America. Dad asked me to drive him to the county hospital to visit the guys. It was terrible, rows and rows of them lying in the beds just waiting to die. After the second time, I told my dad I couldn't take him there anymore." In late 1946, almost all the hostels had closed. Japanese Americans had found jobs and temporary housing and began to rebuild their lives but the huge changes in the Japanese American community brought about by the forced relocation and resettlement, were just beginning. Say, Allen (2004) Music for Alice, Houghton Mifflin, ISBN: 0618311181. Allen Say writes a gentle true story about Alice and her childhood on a California farm. Alice loves music and dancing and dreams often of being a dancer. Years pass and Alice grows up and marries. World War II breaks out and the forced evacuation starts. Instead of going to camp, Alice and her husband are sent to work on farms in desert areas to grow food for the war effort. The book follows them through the post-war years. Although this is considered a picture book, there are many deep topics and a story about a strong and resilient Nisei woman presented in a way children will understand. Reading level: Third through fifth grade. Houston, Jeanne, 1983, Farewell to Manzanar, Bantam, ISBN: 0553262165, Reading level 5th through 12th grade. Houston's book has become a standard part of school reading west of the Rocky Mountains. It is the story of her family's incarceration at Manzanar and their return to the Los Angeles area. Available through Amazon.com and the Asian American Curriculum Project (AACP) see below in website section. Uchida, Yoshiko (1996) Journey Home, Scott Foresman, ASIN: 0663592194. Uchida's book, the sequel to Journey to Topaz, is about the family returning to their home in Berkeley, California. The family's experiences are told in a manner that children can understand. Availabe at Amazon.com. Daniels, Roger, Taylor, Sandra C. and Kitano, Harry, H. L. editors (1991) Japanese Americans: From Relocation to Redress. University of Washington Press, ISBN: 0295971177. The editors present material on the Japanese American experience from the evacuation order of World War II to the public policy debate over redress and reparations. O'Brien, David J. and Fugita, Stephen (1991) The Japanese American Experience. Indiana University Press, ISBN: 0253206561. This is a scholarly work and does have extensive footnotes and bibliography. Tamura, Eileen and Daniels, Roger (1994) Americanization, Acculturation, and Ethnic Identity: The Nisei Generation in Hawaii (The Asian American Experience), University of Illinois Press, ISBN: 0252063589. This book describes the Nisei generation and culture in Hawaii both before and after World War II. Yoo, David (2000) Growing Up Nisei: Race, Generation, and Culture Among Japanese Americans of California, 1924-49 (The Asian American Experience), University of Illinois Press, ISBN: 025206822X. Yoo examines the Nisei generation and how their experiences growing up in the 1920's and 30's ultimately helped them to adjust to camp life. Forward by Roger Daniels.